The CR9000X is a large, modular multiprocessor system that provides precision measurement capabilities in a rugged, battery-operated package. 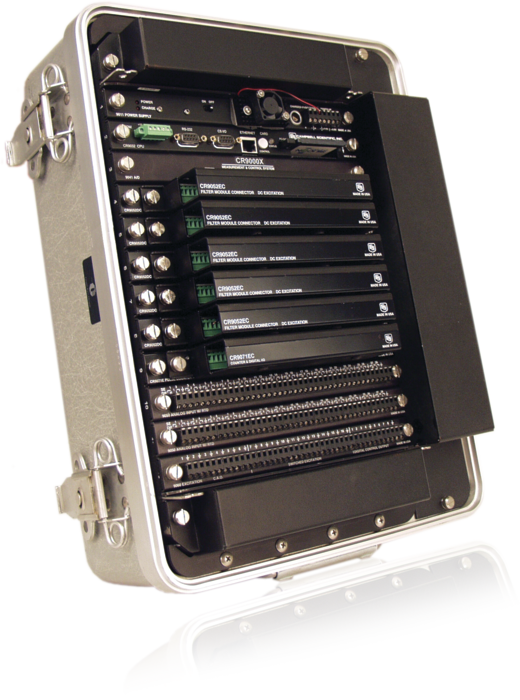 It consists of a base system and a chassis with slots for up to nine user-selected I/O modules. The CR9000X is our fastest data logger, with a measurement rate of 100,000 Hz, making it ideal for rapid sampling applications. For the entire list of available I/O modules for the CR9000X and CR9000XC, visit the Other Accessories section of the Ordering Info page for the CR9000X and the CR9000XC. Campbell Scientific also offers the CR9000XC, a compact version, that accepts up to five I/O modules. For more information, visit the CR9000XC Product Info page. Up to nine I/O modules can be used to configure a system for your specific application.